Diane Eyer, Ph. D. is a Comprehensive Energy Psychologist and Reiki Master. 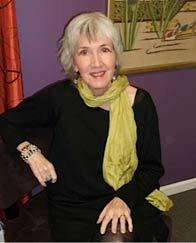 Dr. Diane Eyer is an Energy Therapist and Healer working with Higher Guidance that is steeped in love and wisdom. She is an advisor who works to dissolve what does not serve you, clearing emotional blocks that may also affect physical health. She helps you to gain fresh perspectives so you can make new choices. Her work also helps you to form a deeper connection to God/Divine Spirit and live a life consistent with your truest self.